Find the best suggestion mesh enabled Wi-Fi router for powerful Wi-Fi coverage. All of the suggestions are excellent to large space. Having ample space with the Wi-Fi dead zones? These are the eight best mesh-enabled routers. They provide a reliable Wi-Fi coverage by using more than one access points spread around a house or building. These mesh-enabled routers are an exceptional alternative to those traditional routers for large homes or troublesome buildings where the regular routers don’t cut the boundaries. They are great at giving powerful signal strength to large, multilevel and complicated houses. Here are available best choices of wireless Wi-Fi routers all of them are top rated and well-reviewed. You can control any of these multi-node systems with your smartphone. 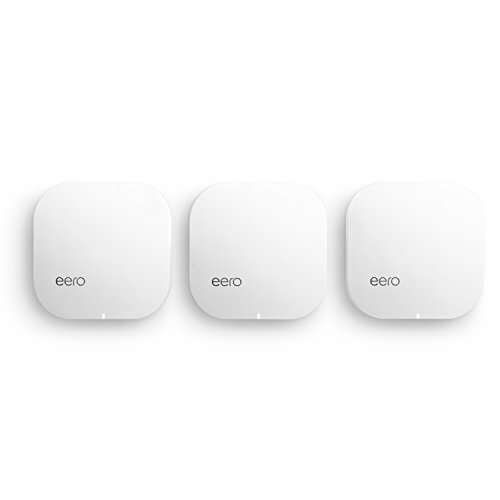 EERO Pro Wi-Fi systems with advanced Tri-Band Truemesh routers. The brand guarantees world’s most simple and reliable Wi-Fi system. It is an ideal Wi-Fi system for the Ethernet-wired houses. It equipped with most intelligent Wi-Fi Technology to provide 2x much faster speed. The EEROs receives regular automatic security updates, in any case, any threat arise the update can be made immediately. The speed of Tri-band Wi-Fi radios is in Gigabit. Simultaneously they give 2.4GHz, 5.2GHz, and 5.8GHz wireless speed. For wired connectivity, the dual auto-sensing Gigabit ports available for LAN and WAN connection. In few taps, built profiles to set schedules as well as pause the web connection on kid’s devices. The brand builds an app to guide a user through setup and placement to create a wireless mesh network. It holds to the excellent standards in network security with providing OTPs for EERO app access. The OPT only allowed for WPA2-compatible gadgets on your network. It exclusively equipped with TrueMesh™ software to provide parental controls for content filtration and SafeSearch. It supports networking services for DHCP, VPN Passthrough, NAT, UPnP, Static IP, Port Forwarding. It even supports Alexa integration, iOS and Android smartphone with a data connection. For utilization, the setup requires for iOS or Android smartphone, internet service and Cable or DSL modem. World’s most straightforward and reliable Wi-Fi system. Two times much faster speed. Tri-brand radios offer 2.4GHz, 5.2GHz and 5.8GHz speed. Regularly receive automatic security updates. Auto-sensing Gigabit ports available for LAN and/or WAN connection. Pauses internet in kid’s devices with few taps. App available to simple set up of routers and internet. For app access the network security provided with OTP. Supports few networking services with excellent settings. Requires iOS or Android device, internet service and cable or modem for setup. It gives ultimate Wi-Fi experience. The robust tri-brand system makes it an ideal solution for easy internet access. Excellent solution for those who have a complicated or really wide house. This Wi-Fi system is able to blanket the house in fast and reliable Wi-Fi connection. The data retention from this system is creepy. This tri-band Wi-Fi system is very costly. There is a lack of support for the directly wired PPPoE authentication. The system needs to be setup with the cell phone app which is very annoying if anybody from a rural area. Google Wi-Fi system is new kind of connected system for the seamless Wi-Fi coverage in your home. It helps to eliminate dead zone and to buffer. It replaces your traditional Wi-Fi system and supports major internet service providers those are Comcast, Verizon Fios, and Time Warner. It is another Wi-Fi system with three Wi-Fi points. A singer Wi-Fi point able to cover up to 1500 square feet, and a set of three able to provide coverage up to 4,500 square feet house. All of them works together, and for more coverage, you can add more to it. It outfitted with Network Assist technology for fast internet speed on your laptop, smartphone device, and any other smart devices. The app allows quick set up and lets you see what is connected, prioritize device and pause the internet on kid’s devices. It bundled with 2 Gigabit Ethernet ports per point and worked as WAP and LAN on vital Wi-Fi points and on additional Wi-Fi points they work as LAN. The Wi-Fi points able to deliver 2.4GHZ or 5GHz simultaneously. For setup, it requires Google account, Android device 4.0 or above, iOS device 8 or above, Google Wi-Fi app, broadband Internet connection and modem. Seamless Wi-Fi coverage for wide houses. Eliminates dead zone and buffering. It supports major web services Comcast, Verizon Fios and Time Warner. A single Wi-Fi point covers 1500 sf. and three points cover up to 4500 sf. of a house. It is bundled with Network Assist Technology. It shows the connected device, prioritize device, and pause Wi-Fi on kid’s device. The 2 Gigabit Ethernet ports packed with Wi-Fi points. The Wi-Fi points deliver 2.4GHz or 5GHz speed simultaneously. The Google Wi-Fi app and the Wi-Fi points don’t track the site you are visiting. You can set up a guest network that is isolated from your main home network. It is equipped with sleek modern design. It can set up within 15 minutes. The Google Wi-Fi system is simple as a user don’t require to log in on a PC to modify the changes. The mesh Wi-Fi technology is a latest universal way for complete home Wi-Fi coverage. It is installed now and leave it alone device. User can’t access the system with using the browser. It doesn’t work with setting custom DNS server, so it is not for business. A user cannot even schedule the time to disconnect the internet connection from particular devices. Amplifi home Wi-Fi Mesh Technology incorporates with the turbocharged 802.11AC Wi-Fi. It utilizes multiple self-configuring radios and excellent antenna mechanism to give ubiquitous Wi-Fi coverage to the house. It has multi-hop mesh technology lets custom setup for the unique home environments to keep fast and complete coverage. It uses Bluetooth Low Energy in devices for internet connection. The Turbocharged 802.11AC Wi-Fi is designed to meet the demands of the modern internet connection at home. It gives high-speed and performance connection, parallel video-streaming, and application with intensive bandwidth. The mesh points’ high-performance antenna design and adjustability let the user extend their coverage and eliminate dead spots. Without any wires and fuss, the mesh points can be seamlessly plugged into any outlet. The app allows the user to see which device is connected to the network. The two mesh points bundled with Turbocharged 802.11AC Wi-Fi. It uses multiple self-configuring radios and advanced antenna technology. The multi-hop mesh technology for a custom setup. Even unique home environment have complete coverage and fast speed. With the high-speed performance, it gives parallel video-streaming. The antenna builds to eliminate dead spot. The mesh points seamlessly plug-in to any outlet. The app shows connected devices. With the setup in seconds, the network is up and running in no time. It tracks ISP and system performance. The router has a built-in firewall. The base stations have no difference between HD/LR versions. The Ubiquity is investing in the platform to keep including the features within 30 days. Easy to test the network and see if there is any issue. Analytics are quite confusing and never quite clear. Simple changes always result in complete system reboots. No actual web interface for the desktop mgmt. Linksys is another Tri-band Wi-Fi system in which brand guarantees internet speed to each edge of the complicated house. The mesh Wi-Fi has Velo’s modular design that performs well each home type, situation and footprint. Each Wi-Fi node point offers 2000 sf. of coverage and with three nodes deliver Wi-Fi connection up to 6000 sf. range can be varied with the number of rooms and placement of points in the system. 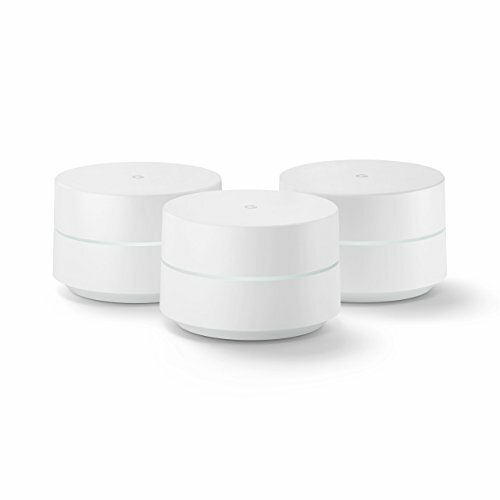 With dynamic Tri-band technology, Velop gives ultra-fast internet speed through the combination of three Wi-Fi radios. Each of the node maximum Wi-Fi load balancing to make sure about high performance in the house. With the ultra-faster internet speed of internet so that user can stream 4K content, gaming or video chatting. It can be paired with Amazon Alexa to manage Wi-Fi with a variety of voice commands. The singular network constantly looks for the connected devices and ensures 100% seamless connection while a user moves through the house. The Linksys app gives a powerful suite of Wi-Fi modification tools to keep track and manage home Wi-Fi from anywhere. With parental controls, the user can make sure a safe internet experience for a kid. Using the app user can restrict access to control usage, block specific devices and inappropriate content. The apps also keep user informed of network status and resolves any type of Wi-Fi interruptions. Velop’s modular design for excellent web connection each home type. Each node delivers Wi-Fi connection up to 2000 sf. With ultra-fast speed, the user can stream 4K content. Incorporating with Amazon Alexa to follow a variety of voice command. 100% seamless connection while moving around the house. Apps offer variety of setting like parental control and so on. A user can also use a switch with this Velop to expand the number of nodes. The nodes can be utilized as a wireless to Ethernet Bridge while expanding the mesh. It has brain dead easy installation. Huge range and blankets entire house in superfast Wi-Fi. Attractive and not clunky router look. It has dedicated backhaul channel to talk between the nodes. It doesn’t offer advanced features such as DHCP range adjustment and particular IP reservation with a mobile app. There is an only mobile application; it doesn’t provide web based admin. For advanced features user have to go through the mobile app. TP-Link offers three node Wi-Fi system with seamless and secure Wi-Fi for each room in a particular house. It offers Deco the most comprehensive security of any complicated home Wi-Fi system. 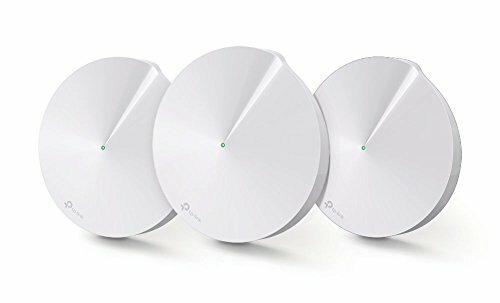 All three routers are designed to send Wi-Fi all directions and provide full coverage for streaming photos, videos, music, and gaming. The Deco includes three years of antivirus security with HomeCare that is powered by Trend Micro. It has parental controls that can be used right from the Deco app. With the parental controls, a user can restrict sites by age, content ratings and categories like news, social media and entertainment. With the app, a user is able to see the reports of internet activity, schedule Wi-Fi access and set the time limits, and even pause the internet. It is QoS internet bandwidth optimized Wi-Fi system to get the best performance from the connected devices. A user can even keep the favorite devices running fast by choosing that device and prioritize that device’s activity. 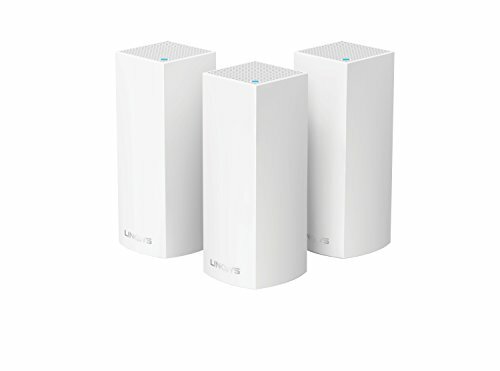 All three nodes offer best connection of 2.4GHz and 5GHz speed simultaneously. All the three nodes cover up to 4500 square feet. The brand also offers two years of worry-free service and limited warranty. Deco is a comprehensive security with best Wi-Fi system. Nodes provide full coverage to stream videos, music and gaming. It bundled with HomeCare antivirus. Deco app with parental controls for restricted internet access. The optimization of QoS for bandwidth prioritization. 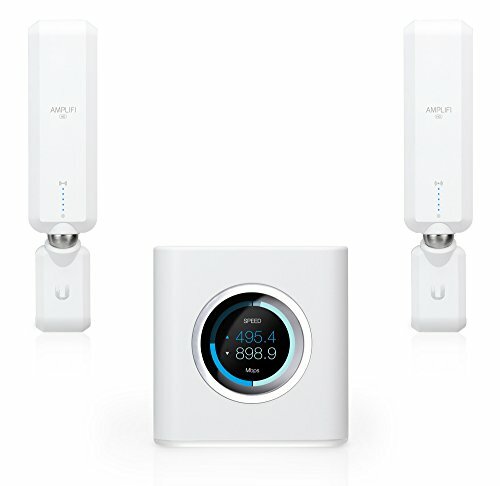 Best connection with up to 2.4GHz or 5GHz. Three nodes cover for about 4500 sf. The brand offers 2 years limited warranty and worry-free service. The setup of this Wi-Fi system is incredibly simple because of the easy-to-use mobile application. The nodes can be controlled and monitored from anywhere in the house using mobile application. Everything in this system is extremely streamlined and user-friendly. It offers excellent Wi-Fi range. It automatically assigns devices either to 5GHz or 2.4GHz. There is a lack of advanced features that are supported in DDWRT. It isn’t able to manage the LAN IP settings with the residential routers. There is no firewall update functionality included yet. 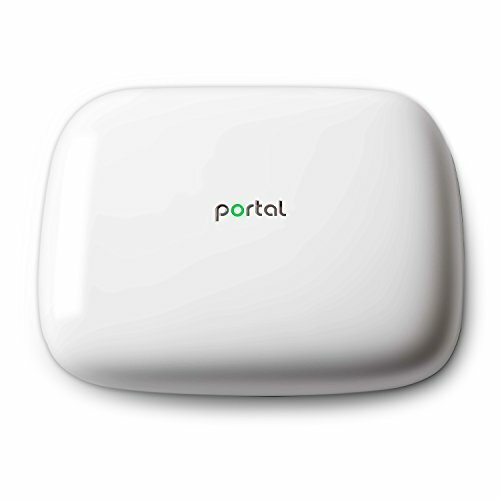 Portal is designed to give reliable fast Wi-Fi for apartments, homes, lofts, condos, and home offices up to 3000 square feet. It is driven by patented with multiple-channel zero-wait DFS FastLane technology. It accesses latest Wi-Fi spectrum and moves all of the Wi-Fi gadgets on fastest channel automatically. It optimizes premium streaming video and music services. The advanced reliability for the smart home gadgets like Amazon Echo, thermostats and security cameras. You can enjoy lag-free gaming and stream without buffering and shop without interruption. The powerful split-intelligence processor with the innovative self-optimization algorithms for consistent and reliable high-speed internet. With 10 times faster state-of-the-art radios it provides 2.4Ghz, 5GHz and Bluetooth smart. The 9 time more powerful, high-gain and power amplified conformal antenna for the maximum range and coverage. It is compatible with all the IEEE 802.11 devices. It supports iOS and Android application for setup and smart configuration. It even let the user setup and configure this Wi-Fi system on traditional PC with the secure WebUI. Patented multi-channel zero-wait DFS for unique radar-protected channels. Powerful split-intelligence processor with the self-optimized algorithm. Both technologies offer consistent and reliable high-speed Wi-Fi connection. 10 times more best connection with up to 2.4GHz and 5GHz. 9 times more powerful antenna fore broad area coverage. Compatible with all the IEEE 802.11 devices. It requires Android, iOS, PC, cable and modem for installation. The compact sized router is pretty excellent to provide a good range of Wi-Fi coverage. It offers Wi-Fi connectivity for up to 3000 square feet. With the easily understand instruction the brand makes it an easy install. It increases in all areas like ping, download speed, and upload speed. It is compatible with virtually any internet services. It offers password protected connection that is an inbuilt option it this Wi-Fi system. Ethernet is half of the speed of the wireless connection. The app and the web GUI is not able to show the connected devices. It even has the issues connecting multiple devices repeatedly. NETGEAR is high-performance Tri-Band Wi-Fi system. It provides a single Wi-Fi network for complete home. There is no need any account to set it up, just plug in and use the instruction on smartphone devices. The Wi-Fi system intelligently takes care of network to give strongest and faster Wi-Fi connection. As more devices connected to it the speed of Wi-Fi connection remains constant with more speed to the end devices. It never compromises with the speed while more and more devices connect to it. It covers up to 5000 sf. with high-speed Wi-Fi. It quickly setup separate and secures the internet access for the guests. It is compatible with Amazon Echo and Alexa to control home network with the voice commands. 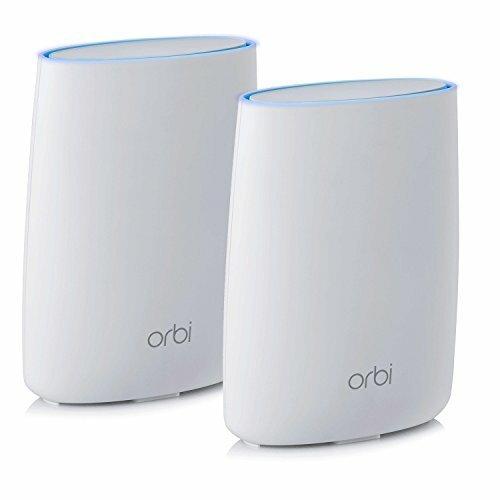 The user can control this Wi-Fi system, with the Orbi mobile app, and the even user can control it using a web browser. It utilizes intelligent Wi-Fi system for robust and fast internet connection. Never compromises while connects more and more devices to it. Gives constant and more speed to the all the connected devices. It covers up to 5000 square feet area. Separate setup and secure internet access. Compatible with Amazon Alexa and Echo. A user can control with using mobile app and web browser. It can be used with any internet cable, just connect it with the current modem. It provides 2.4GHz and 5GHz speed. The distance is outstanding and super fast. The connection even breaks all the plaster walls, concrete walls, and multiple concrete outbuildings. It is probably low cost than purchasing a wired router, installing separate access points and running Ethernet cable. Currently, the Ethernet backhaul is not supported. The installation is a bit troublesome. The Firmware update is quite buggy. The iOS app available is terrible. All the Wi-Fi mesh routers are promised to solve the issue of Wi-Fi’s strengths and weakness. All of them claim to support mesh-networking. Some of them are quite costly but support high-speed Wi-Fi connectivity. Are you thinking about spending on any one of them? Do let us know in the comments section which one have you bought and how does it go?